Our services provide great solutions for the sports and leisure sector. Robust and water resistant cubicles, shower units and bench seating systems made in CGL (Compact Grade Laminate). In an enviroment where high usage and a great level of security is needed, our washrooms can provide you with the system you're looking for. 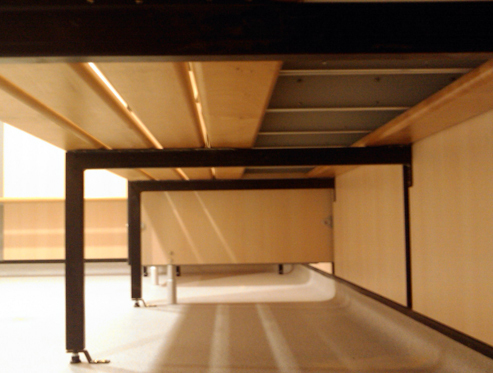 Our lockers combined with bench seating are of the highest security. Our units are all made to standard sizes but we also provide a bespoke service; please get in touch with us if you need a specific solution. Washrooms designed for the sports and leisure industry require extra strength and durability due to the high volume usage which can leave the washrooms easily damaged. At Oliveti Cubicles we provide the best manufacturing quality and count each sector project as unique allowing a high class service. If you're looking for a top class washroom system and dedicated team of workers then please call us on 0116 277 7771 and request a quote. Our shower cubicles are very rigid and designed to last, they compliment our washroom enviroments no matter what kind of high usage facility you may have. Your facilities will of course need changing rooms to ensure your customers have the atmost privacy when getting in and out of clothing, also providing space and security in these enviroment. At Oliveti Cubicles we can provide bespoke changing room systems so there is no limit to space or any other factors. For more information on changing rooms or any other of our services please give us a call or email us to request a quote. Security is one the main priorities when it comes to the sports and leisure sector and so we provide highly secure lockers (see the lockers section for more information).